March 18, 2015 By Allyson Leave a Comment This post may contain affiliate links. Read my disclosure policy. 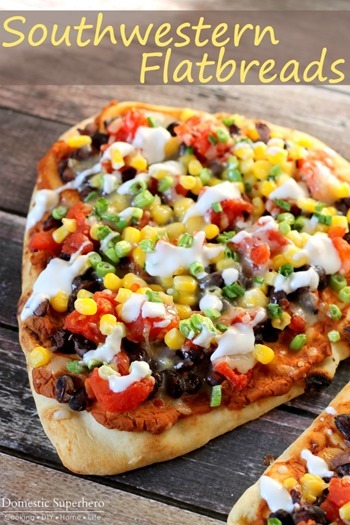 Naan bread is such an easy tool for throwing together an awesomely quick and delicious dinner! 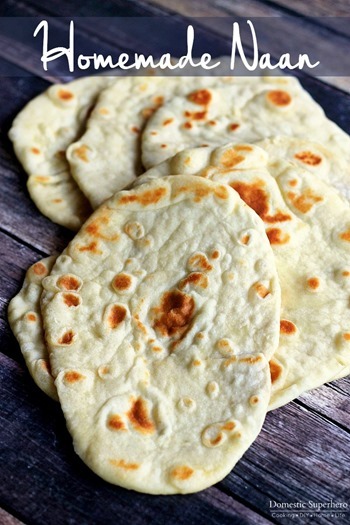 I usually keep a package of naan in the freezer or I whip up a fresh batch (recipe here), that way I can just take them out whenever the mood strikes, or when we don’t have much time to throw together dinner. 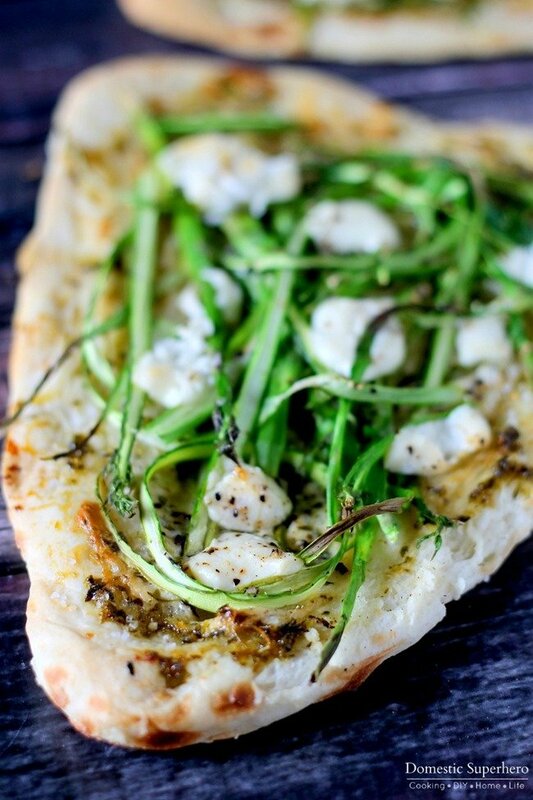 For this flatbread, I paired asparagus, delicious herbs, and creamy goat cheese. 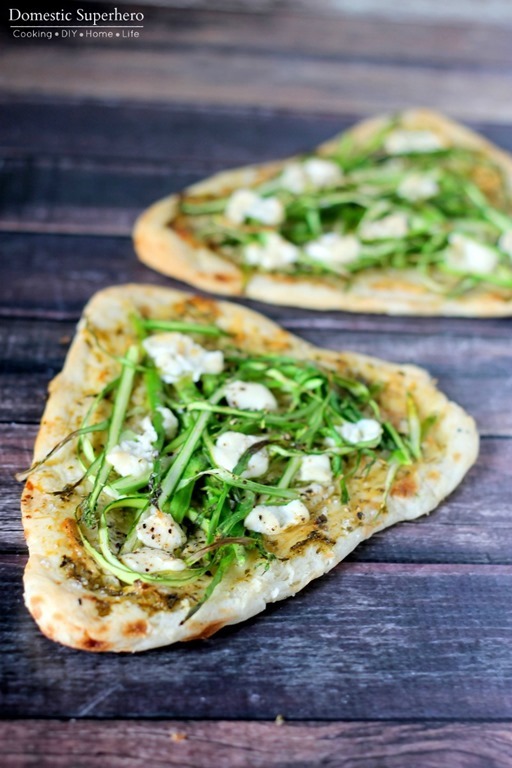 These Herbed Asparagus & Goat Cheese flatbreads turned out amazing. It took less than 20 minutes to whip these up, and way less time to eat them! I love using asparagus now that it’s coming back into season, and for this recipe a little goes a long way. I use a vegetable peeler to peel thin slices of asparagus, but you could also just finely slice them with a knife. I usually leave the spears whole, because if you slice those, they kind of crumble apart. After rubbing a little olive oil on the top of the naan, I sprinkled it with various herbs – thyme, basil, parsley, and oregano, and then rubbed them around with my fingers. After that all you do is top with a pile of asparagus slices (use a lot, it cooks down), dot goat cheese around, and then top off with a few cracks of pepper and salt. Pop it in the oven for 10 minutes, and then remove and eat it up immediately. The recipe I am sharing is for 2 breads, but you could easily double it for 4 breads. Don’t like goat cheese? 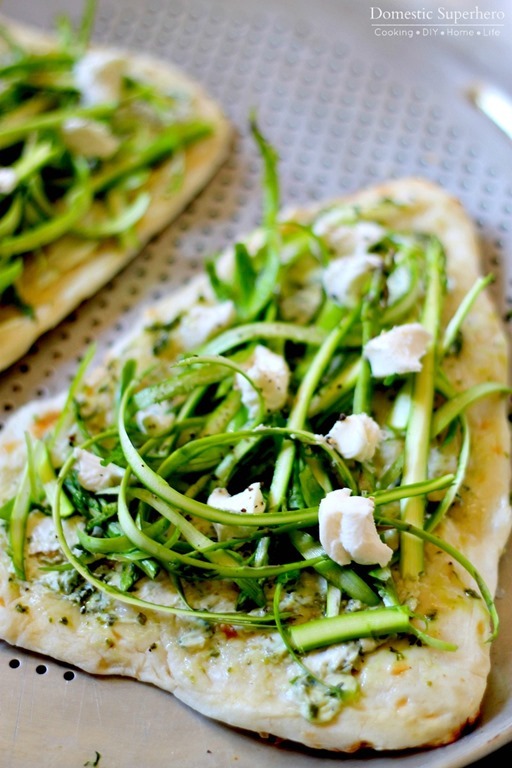 Use feta or brie instead – yum! 2. Place both naan onto a lined baking sheet. Drizzle 1/2 TBS olive oil onto each naan and spread around. Sprinkle the basil, oregano, and thyme over the oil and lightly rub it around with your hands or the back of a spoon. Divide the asparagus spices in half, then put half on each bread. 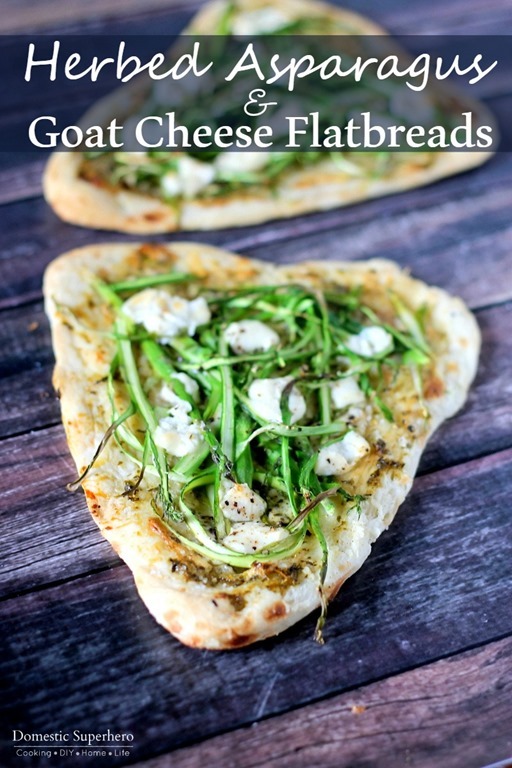 Top with 2 ounces goat cheese on each bread, then a few cracks of pepper and salt. 3. Place into oven and bake for 10 minutes. Remove from oven and serve immediately. 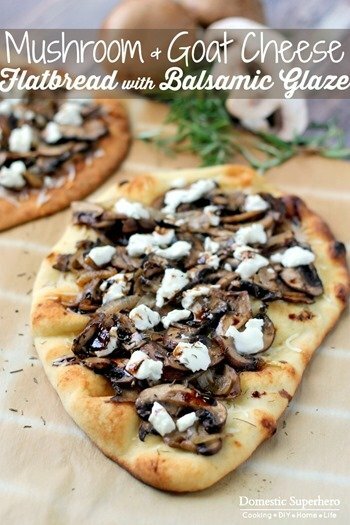 These could easily be cut into small pieces and work well as a party appetizer!